“Go the extra mile for families, but don’t take forever to get there” is the title of a chapter in my latest book, Unshakeable: 20 Ways to Enjoy Teaching Every Day … No Matter What. Today, I want to share with you some ideas from that chapter about being pro-active with your students’ parents. With some parents, you can tell from your very first interaction that there will be challenges ahead. You’re probably going to have so-called helicopter parents in your classroom who hover over their children, question all your decisions, and insert themselves into every minor classroom issue. And you will probably have some uninvolved parents who don’t pick up the phone when you call or return signed forms to school or show up for parent conferences. Depending on the community you serve, your school will probably skew more heavily toward one end of the spectrum than the other. You should expect to encounter these types of parents and plan ahead for it. Don’t be caught off guard when parents don’t fit your expectation of the Perfect Amount of Involvement. It’s important to do everything you can to contribute to a good working relationship with your students’ parents. Thinking that you don’t have the time or energy to build relationships and that they should just magically do what you want them to do, and nothing more, is just going to make your job harder and awfully unpleasant. Choose to be pro-active. Learn which parents want updates on everything, and be sure to keep them in the loop as much as possible. If you just know you’re going to get a phone call about something, don’t sit around and fume about it! Head that parent off at the pass with a note or phone call to explain your side of the story before any misunderstandings occur. You don’t have to sit around passively, waiting for your daily email from a “helicopter parent” demanding information or accommodations, and then scramble around to try to pacify them. Take the lead, and call the parent in for a conference and set up a workable system that both of you can agree on. Figure out exactly what they want from you, provide as much of that as possible, and draw firm boundaries around the things you’re unable to do so they’ll stop asking. When parents seem to think of a new request every day, offer to set up a standing conference time or informational session once a month to discuss upcoming projects or units of study and address any questions the parents might have. Many times, the real issue for micromanaging, hypercritical parents is fear: They are afraid of not having control over their child’s life and are afraid their child might not get the absolute best possible education. So in every interaction, try to alleviate those fears by giving the parent lots of information up front and the chance to ask questions, make suggestions, and request accommodations. I’ve found it’s much less stressful and time-consuming — both for me and for the parents — if I provide time for these discussions in advance, rather than handling every issue day by day as it arises. Showing the parent you are taking his or her concerns seriously, doing everything you can to meet the child’s needs, and are willing to confer about progress on a regular basis will work wonders — especially if you do it with a genuinely positive attitude. 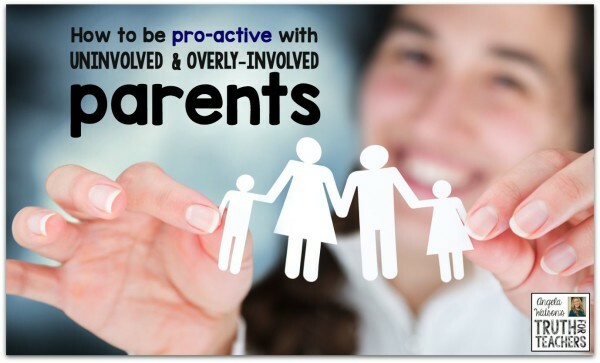 Being pro‐active is also the solution for parents who don’t interact with you enough. If you know certain parents aren’t going to return a form or show up to a meeting, figure out how you can set them up for success. Don’t be that teacher who sends home a single note while mumbling, “She’s never going to read this” and then runs off to the staff lounge to complain about how uninvolved students’ parents are. Instead, have some extra copies of notices already run off and be prepared to send them home again without getting upset about it. I’ve found it’s easier to have a good attitude about the extra work that comes with supporting parents by reminding myself of all the times I’ve needed additional reminders, have forgotten dates, or lost important paperwork. For example, I’ve been pretty bad about completing and returning important tax documents to my accountant. Opening my mailbox to find an envelope stuffed with papers written in legalese feels overwhelming and intimidating to me, and so I procrastinate in handling it. But my accountant never gave me a hard time or guilt trip about it. Instead, he started sending me copies of the forms with important information highlighted and little stickers that show me exactly where to sign. He even includes a stamped, self‐addressed envelope to increase the chances that I will get the documents back to him quickly. I assure you this is much more effective than if he’d sent passive aggressive reminders and sat around fuming to himself: How hard is it just to fill out some forms and send them back? These are important documents! All my other clients return their forms on time. If Angela won’t sign, then fine, it’s her loss! It sounds kind of silly when you apply the situation to someone else, doesn’t it? The truth is that anytime you make a request simpler and faster for someone else to complete — and you do it without acting like it’s a gigantic inconvenience — you’re going to have a greater chance of getting the result you want. If you’re a very conscientious person who rarely has problems returning forms or showing up on time for meetings, use those strengths to help parents who struggle. Think about what procedures you put in place that makes you so successful with organization and time management, and try to set up those procedures for students and parents, as well. I like to send home several parent surveys throughout the year to help connect parents to volunteer opportunities that meet their needs and get their input on how the school year is going. The common theme here is adopting an attitude of grace toward students’ families. Be kind and welcoming whenever a parent makes an effort to support their kids’ education, even if it’s not the type or quality of support you’d prefer. Sometimes the choice is to be right or to have a right relationship with someone else, and it’s worth considering which one is the case for you. If you don’t meet a certain parent until he shows up for an end-of-year event, what purpose does it serve to give him the cold shoulder or remind him of all the events he missed? Just smile and tell him how happy you are that he made it. If a parent sends you 10 different websites with research on improving the way you teach writing, how is it helpful to get defensive and tell everyone you know how rude the parent was to question your methodology? Tell her thank you, and check out the links. Who knows, she might have saved you a lot of time in looking for great new teaching ideas! We have no idea what struggles people have behind closed doors. We also don’t know their perception of school: Many of our students’ parents were told they were failures or had other extremely negative experiences when they were students, and school is an uncomfortable place for them to be. Other parents may have had bad run‐ins with their child’s other teachers and are extremely wary of trusting you. Although you can’t undo that damage and are not responsible for it, you can create a positive experience for parents in the present moment. Remember, the objective here is to enjoy teaching every day. It is not to teach parents a lesson or make people behave the way they “ought to.” You can fight a battle without letting it consume you mentally, and you can also let things go for the sake of having peace. It took me years to figure out that it’s pretty normal for teachers to have at least one parent every year who cusses at them, micromanages and constantly questions them, goes over their head to the principal about a minor issue, or disrespects them in a myriad of subtle (or not so subtle) ways. Be mentally prepared for that and don’t take it personally! This happens to every teacher, whether or not they tell the world about it. Don’t let negative parents get you so discouraged that you stop trying to build rapport with everyone else. Don’t punish all the other parents because one or two of them are impossible to please. You must choose not to let a handful of parents steal your joy and enthusiasm for teaching because there are many other families depending on you. Never give up and always keep pushing to make parents your allies. Keep reaching out to your most challenging parents and document every attempt at communication. You always want to look back and know that you truly gave your all, feeling confident that any rifts in the relationship didn’t stem from a lack of effort on your part. You and I are partners. I like your child and am taking time to get to know him/her. I enjoy my job and am excited about teaching. I am easy to get ahold of and will be responsive to your needs. I don’t judge you or your parenting style, and I truly believe you are doing the best job you can. I’m not intentionally trying to make your life harder or infringe on the way you run your household. I’m doing everything I can to help your child learn and be successful, and I’m never, ever going to give up. I want to be a team with you. Let’s partner together for the sake of your child. Thank you for these excellent reminders. It’s just the first week of school but already I have seen both sides of this parental involvement coin and I just appreciate the reminder and challenge to season all my actions and interactions with grace! Thank you so much for these reminders! I try to remember that some parents did not have a positive school experience of their own, and now I have the opportunity to change that mindset. Thanks again for these simple but effective strategies.